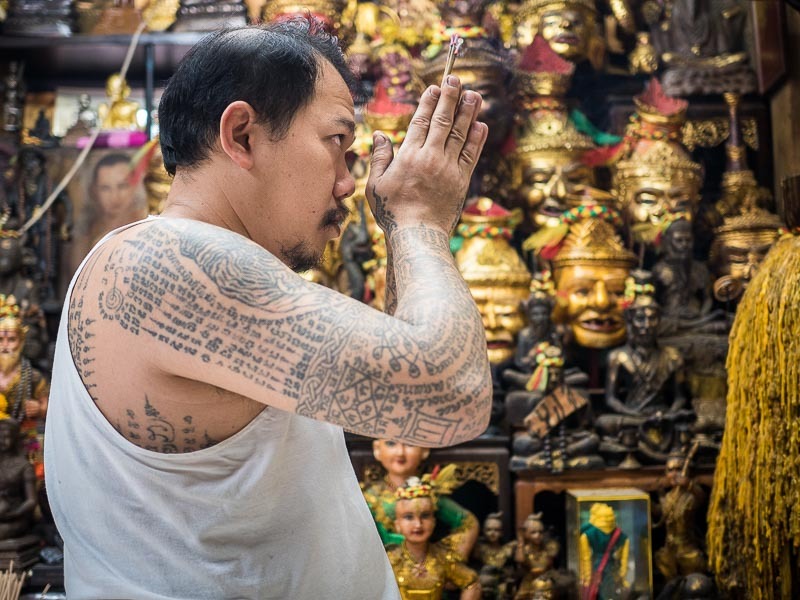 Ajarn Neng Onnut prays before starting his day tattooing people who come to his home in Bangkok. Ajarn Neng Onnut is a master of the spiritual Sak Yant tattoo. He is one of the most famous tattooists in Thailand. People who believe in the power of the tattoos come from across the Kingdom and around the world to get a tattoo from Ajarn Neng. The Ajarn's assistants steady a young woman getting a tattoo while the Ajarn tattoos her. His studio is really more of a chapel. The walls are adorned not with pictures of tattoos but with religious paraphernalia. Ajarn Neng's work has been featured in the book "Sacred Skin." He is a regular at the Wat Bang Phra Tattoo Blessing Ceremony in Nakhon Pathom. A visit to his home (he works out of his home) is nothing like visiting a tattoo parlor in the US. There's no music. No whirring of the tattoo guns. In fact, aside from people praying and the occasional small talk, it's silent. Ajarn Neng uses long hollow stainless steel needles. He dips the needle into a reservoir of ink and goes to work on his subject's back, arm, neck whatever. He sanitizes the needles between tattoos by putting them into an open flame and a disinfectant. There is no autoclave or similar sterilizing device. The tattoos are all, every single one of them, done by hand. He works with astonishing speed. A complex tattoo of a stylized lion, for example, takes only a little over an hour. A simple tattoo of a prayer takes about 30 minutes. A woman prays before getting a tattoo. The Ajarn does not tattoo people for ornamental reasons. This isn't "body art" in the sense that tattoos in the west are. Sak Yant tattoos, like those the Ajarn applies, have specific spiritual meanings. Soldiers might get one to help them in battle. A business person might get one to help him or her succeed in business. Another person might get one for personal reasons, for example to keep negativity at bay. Sak Yant tattoos have become popular in the west as a form of body art. Thai religious leaders discourage tattoo parlors and tattooist from giving people Sak Yant tattoos for purely decorative reasons. Ajarn Neng interviews people before he gives them a tattoo. A woman makes an offering to the Ajarn before he blesses an existing tattoo. Everybody who comes into Ajarn Neng's space has to pray before he will consult with them. 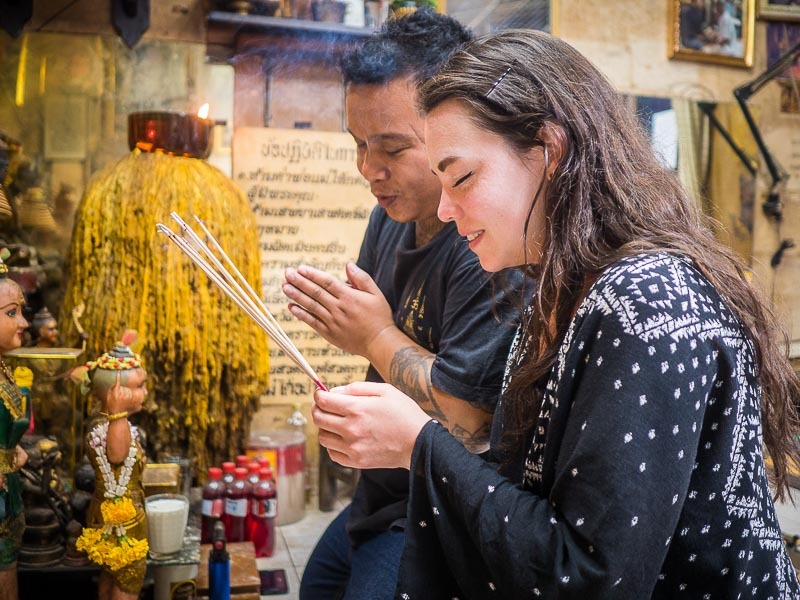 His assistants guide newcomers and people not familiar with Thai spirituality through the process. One of the Ajarn's assistants helps an American with her prayers before she met with the Ajarn. He meets with people getting a tattoo before he starts working on them and talks about their spiritual needs and what they want from the tattoo. Some might come in with no idea of what they want and leave it up to the Ajarn to select something suitable. Others might come in with a specific tattoo in mind but after consulting with the Ajarn select something different. Still others might come in with a specific tattoo in mind and that's the tattoo they leave with. A woman from the UK gets a spiritual tattoo on her back. I spent two days with the Ajarn. There is a very inviting vibe to his place. People drop in to chat with him about their spiritual needs, others come in to get existing tattoos blessed or renewed, there's a steady stream of people coming for tattoos and the Ajarn makes time for all of them. Although the Ajarn speaks a little English, there's almost always someone there who can help visitors with the complexities of Thai and help bridge the gap between the Ajarn's English and tourists' total lack of Thai. A blind man rests contemplatively while he waits to meet with the Ajarn. It was his birthday and he wanted the Ajarn to pray on an existing tattoo. In some ways this is the undiscovered part of Bangkok I enjoy working in. In other ways, Ajarn Neng Onnut is anything but undiscovered. As out of the way as his place is, and it is very out of the way, several kilometers down Sukhumvit Soi 93 in a small residential development, foreigners always find their way to his place. In the time I was with the Ajarn, he gave an interview to an American journalist and tattooed two Americans and a Briton. His place is a beehive of activity. There are more photos of Sak Yant tattooing in my archive.